If you have been experiencing problems with an arizona brown spider like the arizona brown recluse spider consider implementing a serious spider pest control program. Doing so will greatly reduce or completely eliminate these problems. Part 4 of our spider control series. But before you can work on implementing these three, a thorough inspection of all premises is required. Your goal here is to locate and destroy all spiders and webbing you find; look hard, check everything inside and outside the home. Check and shake your clothes before putting them on. Check and shake all bedding, including bed skirts (although its best to remove skirts) before going to sleep. The brown recluse spider is notorious for hiding in the most unlikely places and their bites are amongst the most unexpected and in the most unlikely places. So be thorough. Note: Safety equipment that should be worn consists of items like a bee veil, coveralls, boots, gloves, etc., Pants can also be worn, only make sure they are constricted at the bottom with a rubber band to prevent spiders from crawling in. Ouch! After initial inspection is complete get ready to do some heavy cleaning. This should not be much work since you have already begun by getting rid of all webbing during initial inspection. Note that storage areas are usually the biggest problem, especially if there are open cardboard boxes inside. These are commonly infested by recluse spiders. Clean everywhere, make your home look like it's for sale! Any spider, webs or other bugs you find must be disposed of away from the premises in sealed bags. This prevents eggs and larvae from falling everywhere. Use sticky boards, these can be placed all around the home along walls and near entrances. A great number of spiders can be caught in them which helps monitor the amount in premises. If at this point you are still seeing spiders use flushing agents such as pyrethrins to "flush" them out and to more easily locate breeding areas. You will be surprised to find that spiders do not need a big hole or crevice to get into your house. Never mind about a hole, all they need is a small crack, and before you know it, you got an infestation. So, you are going to have to do a lot of work here to completely seal your home. And it may not be finished the same day, or week. It is better to take your time than just give up. The good news here is that this process is not all that complicated even though you will find yourself crawling into real tight spots in the attic, basements, underneath the home, etc. Like I said, none of this is as bad as it sounds. So, grab your iPod and let's get to work. Side note: You will be killing two birds with one stone here. Not only are you going to be keeping spiders and other pests away from your home but you will also see your electric bill go down substantially. By the time you are done you will have a bug free and air leak free home. Acrylic latex caulk or silicone. A caulk gun is not necessary but can be real useful for sealing small holes, less than 1/4 inch. Expanding spray foam insulation. You are likely going to run into holes (or cracks) that are just too large. Anything bigger than 1/4 of an inch needs to be filled with foam insulation. Use special high temperature caulk when working on chimneys and flues. Inside your home, walk in every single room inspecting every wall, ceiling and flooring. You may have to pull apart all carpeting if infestation is real bad. The brown recluse spider loves dark places like under the carpet in some corner. If you don't suspect any spiders or other pests in your carpeting you can just do an effective carpet cleaning treatment. Click here for more. Here are some often overlooked areas that are important to double check. Seal every crack, every crevice, and hole you see. If you have a basement, check the area where the foundation meets the wood and framing, often called Basement Rim Joists. By now you should be pretty familiar with the process, so don't get so comfortable that you neglect insignificant cracks. Start by going around the property inspecting every wall, the home foundation and roof from the outside. If necessary, dig around the foundation in order to inspect and seal any cracks and holes you may find. You may need building materials in order to be thorough, depending on the home, these will vary. Don't forget window sills, door thresholds, and around pipes where spiders can crawl in. Now all you have left to do is your home surroundings and yard work. When doing yard work always keep in mind that spiders don't like being disturbed, so look for items such as wood pile, leaf litter, rocks, and other breeding habitats. Don't give them a chance to get comfortable. For better results use pesticides for serious brown spider infestations. Read and follow the instructions on the container. As a general rule you should spot treat places around the home like corners, cracks, holes and crevices, all of which should be completely sealed. A pyrethroid pesticide works well here and dust pesticides can be used for crawling spaces. There are other pesticides that work well against the brown spider but only a handful that we will review and recommend. 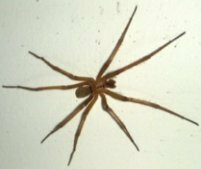 We sincerely hope these "big 3" tips help you get rid of the annoying brown recluse spider. You should know that this spider is very difficult to get rid of but can be done if the steps outlined above are followed. The specific order in which they are outlined is the most effective way to getting rid of them, but you can use them as you please. And should you have any questions about this spider or any other pest, don't hesitate to give Atomic Pest Control a call.